A new edition of the PA Wilds Design Guide for Community Character Stewardship, a popular free tool for communities in the Pennsylvania Wilds, is now available for download, and a national expert on sustainable development called it and the work it relates to one of the best rural development effort in the nation. 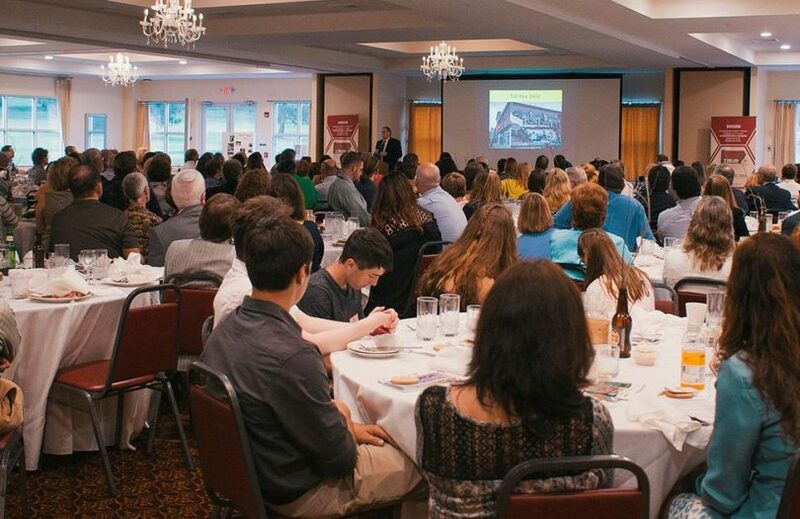 He said the comments to a crowded room of more than 250 people from across the region who had gathered at the DuBois Country Club this spring to unveil the Second Edition of the Design Guide and celebrate other milestones in the Pennsylvania Wilds effort. “People in the world that I work in… talk about this initiative all over the country, because it’s about taking what’s special and making it valuable,” McMahon said. The Design Guide is a core program of the larger Wilds movement, which also includes regional marketing, growing and connecting unique place-based businesses, youth outreach, regional planning and inspiring stewardship of natural and community assets. Many local stakeholders from the public and private-sectors are involved in the Wilds work. State and federal partners are also at the table. PA Wilds Center, a regional nonprofit, is the coordinating entity of the landscape-level effort. The nonprofit on Friday released the free download link to the Design Guide Second Edition, as well as a link to McMahon’s presentation. He went on to say that communities have two choices, to shape development or to let development shape them. “There is no place in the world today that will stay special by accident,” he said. McMahon helped inspire the original Design Guide, which rolled off the presses in 2007, just as the Wilds effort was starting to gain steam. It was a product of the PA Wilds Planning Team, a grassroots stakeholder group that includes the region’s 12 county governments and dozens of other nonprofit and economic development stakeholders from across the Wilds. The document provided tips and illustrations on how communities, developers, architects, business owners and others could be good stewards of their community character as they grew. Several counties in the Pennsylvania Wilds amended their comprehensive plans to include the Design Guide, and other organizations voluntarily made its use a requirement for accessing mini grants and other similar types of programs. Over the last few years it has been used by a variety of partners to guide development projects of all types and sizes, from chains looking to do something less cookie cutter to communities looking to better reflect their history or connection to nearby natural assets. The new Design Guide includes new chapters, is far more visual than its predecessor, and also highlights more local examples of its practices in action, said Clearfield County Planning Director Jodi Brennan, whose committee spearheaded the overhaul. An award-winning resource unto its own, the Design Guide has proved seminal to the Wilds partnership being able to compete for additional resources for the region, including two rounds of signage mini grants, one round of design assistance grants, and most recently, $183,000 for a regional façade grant pilot program targeting Route 6 communities in the Wilds, all of which have or will leverage tens of thousands of dollars in private-sector investment toward strategic revitalization efforts. Community leaders, business or property owners, architects, developers, government partners and others on the front lines of shaping growth in communities in the Wilds are encouraged to check out the new Design Guide and McMahon’s presentation. The Pennsylvania Wilds includes the counties of Warren, McKean, Potter, Tioga, Lycoming, Clinton, Elk, Cameron, Forest, Clearfield, Clarion, Jefferson and northern Centre. For more information about how to join The Wilds Cooperative of PA, our core business development program, contact LaKeshia [lknarr@pawildscenter.org]. Downloads of the PA Wilds Design Guide are available on this site for free. For other inquiries about the Design Guide, contact Jodi [jbrennan@clearfieldco.org]. For information on where to obtain PA Wilds branded tshirts, hats and other products wholesale, or to apply to use the PA Wilds logo on saleable or non-saleable items, email Carol [cszymanik@pawildscenter.org]. To learn more about how to bring our entrepreneurship programming to your school, classroom or event, email Carol [cszymanik@pawildscenter.org]. For information about how to nominate a champion from your area, contact Carol [cszymanik@pawildscenter.org].